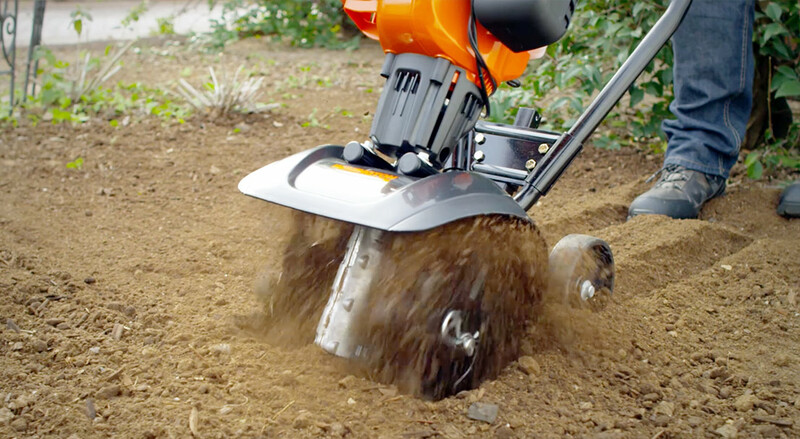 Like all well-oiled machines, your garden cultivator needs some TLC from time to time. Here are a few maintenance musts to help keep your equipment running for many growing seasons to come. You’ll want to clean and re-oil the air filter at least once a season, and after every 10 hours of use. A dirty air filter can lead to poor performance or even permanent engine damage to your garden cultivator. Unscrew and remove the air filter cover, then remove the screen and air filter. Thoroughly wash and rinse the air filter with detergent and water. Let it air dry. Then lightly coat the air filter with clean SAE 30 oil. Squeeze the air filter to distribute the oil and remove any excess. Replace the air filter and screen. NOTE: Never operate your cultivator without an air filter and cover screen. Swing the cover to the right and align the cover screw with the hole. Now tighten the cover screw – be sure not to over tighten. All the tines will wear evenly; so replace them all at the same time. Only replace one side at a time. Stop the engine and allow it completely cool. Then set the unit on a flat, level surface. Tip it back to a horizontal position; the handlebar should touch the ground. If necessary, wash off the tines and tine shaft before removing the tines. Locate and remove the cotter pin from the end of each tine shaft. Then, slide each tine off of the tine shaft. Clean and oil the tine shafts. Slide the new tines onto the tine shaft – the hubs should face each other. On the left side of the tine shaft, the rotation arrows should face the gearbox. On the right side, the tines should face away from the gearbox. Insert the cotter pin at the end of each tine shaft (ensure a secure connection). Now reconnect the spark plug wire, and you’re ready to cultivate. Get to know the basic parts of your cultivator as well as how to operate it.